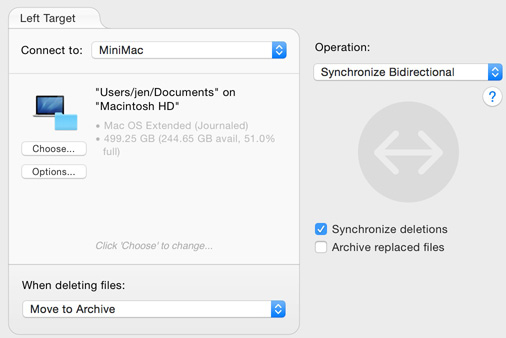 This guide is linked as part of the Sync The Home Folder Between Macs Using ChronoSync guide. It will detail how to create a synchronizer task to keep your Pictures subfolder in sync between two Macs. Also, this guide assumes you already have ChronoSync installed on your primary Mac, and ChronoAgent installed on the Mac you will be syncing these folders to. If you don't already have this setup, just review the 'Setup Steps' in the Sync The Home Folder Between Macs Using ChronoSync guide. Many of the steps performed can be accomplished by using a standard file sharing connection and you technically don't need to install ChronoAgent. However, ChronoAgent offers better performance, security and reliability versus a standard file connection. It also eliminates common problems, such as permission errors, that typically occur when using standard file sharing. Before running any sync for the first time, make sure to backup all data on each Mac in the event something goes wrong. Since home-to-home files syncs are usually bi-directional syncs (syncing files both directions), this is especially important. When running any sync, ChronoSync can archive any changed or deleted file. Having this archive is extremely convenient in case of emergencies but restoring from it can be a bit unwieldy. It is much easier to restore files from a backup so we do recommend taking the time to do so. Home subfolder syncs must only be done between identical versions of macOS. For example, do not attempt to sync between Sierra and High Sierra, and avoid syncing between different versions of the same OS (10.13.1 vs 10.13.2). Also for home subfolder syncs, ensure all apps such as Photos, iTunes and Calendar are the same version. Of course personal files, including documents, raw media files, downloads, etc., can be synchronized or backed up to any macOS version or any device accessible via Finder using the Mac on which ChronoSync is installed. Never attempt to sync files outside of the home folder such as 'Applications', 'System', or 'Library' between two Macs. Problems can arise if these files are synced, easily resulting in application failure or a corrupt OS. In syncing two Macs, the focus needs to be on the home folder and the data files stored therein. Make sure you have the same version of Photos on both Macs in order to synchronize the Pictures folder which contains your Photos library. However, image files, like .jpg files, can be synced between any OS that your Mac can copy to, including Windows. The Pictures folder is where image files are generally stored. It is also the location of the Photos library. The Photos Library is a single package file that contains all of the images within the library in addition to other files and folders that make the library function. It can be synced back and forth between two Macs as long as a few rules are followed: always run the sync when switching Macs and always run the sync from the same task document. ChronoSync cannot merge two dissimilar Photos libraries. The first step in syncing the Pictures folder is to create a master Photos library on one of the Macs. This guide assumes that you use the ChronoSync Mac to create the master Photos library. Of course, this all assumes that you don't already use iCloud to keep your photo libraries in sync. If that is the case, you don't need to go any further and instead allow iCloud to handle keeping the libraries in sync. It is suggested that if you do use iCloud for synchronizing this type of media, you should simply exclude your Photos library from any home-to-home syncs that you may be performing, using the Analyze panel's Exclude function. On the Mac that doesn't have the master iPhoto or Aperture Libraries, make a backup of the Pictures folder before running any syncs. You could simply drag the Pictures folder to your desktop, or use ChronoSync to create a backup of that folder on an external drive or NAS. Open the Pictures Folder on the Mac that does not have the master libraries and drag the contents to the Trash. You need to start with an empty Pictures folder so that the first sync will result in everything from the Master Library on the ChronoSync Mac replacing all Pictures files and folders on the non-ChronoSync Mac. Just don't delete the parent Pictures folder located in your Home folder. Launch ChronoSync. Upon launch, the Document Organizer window is displayed. Choose 'Create a new synchronizer document' to create a new sync document. If the Document Organizer window isn't visible, choose 'File - > New -> Synchronizer' from the menubar or use the shortcut keys COMMAND-N. Give the sync document a meaningful name such as 'Sync Desktop Folder Between iMac and MBP' if this is going to be used to sync your desktop folder between the Macs. One of the greatest advantages of ChronoSync is the usage of documents. Just like a word processing document, a ChronoSync document can be saved as a double-clickable document. Once you set up a synchronization, all the information that you specified in the document is saved - even synchronizer options! Furthermore, this document keeps track of changes between every sync which allows ChronoSync to know what has changed since the last synchronization. 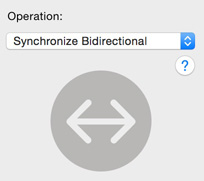 Choose 'Synchronize Bidirectional' from the Operation popup menu. A bi-directional synchronization is performed by selecting the most 'up- to-date' file between the two targets and making sure that file is synchronized to the other target. Choose 'Local Volumes(Admin Access)' from the 'Connect to:' popup menu in the Left Target Pane. Since our example utilizes a connection to ChronoAgent running on another Mac, Admin Access grants ChronoSync the authority to update file ownership and group membership settings to match the user account on each of the two Macs. Understanding the concept of targets is important to simplify the synchronization set up. We often refer to the targets as the source and destination, or left and right. Generally, the source target or 'Left Target' is the Mac that ChronoSync is installed on. The destination target or 'Right Target' is the Mac running ChronoAgent that you connect to. It can be helpful to have a meaningful name instead of 'Left' and 'Right' Target. To use more meaningful names, just click on the 'Left Target' and 'Right Target' labels and specify a custom name such as 'iMac' and 'MacBook Pro' to make things more understandable. On the Setup panel, choose the targets. This is done by clicking the respective "Choose..." button for each of the targets. This will drop down a file selection sheet for you to choose the desired folder. In this example, choose the Pictures folder for the Left Target by navigating to your home folder, selecting the Pictures folder, and clicking 'Select'. For the right target, click the 'Connect to:' popup menu and locate the name of the ChronoAgent Connection Profile you created when performing the 'Setup Steps' in the "Sync The Home Folder Between Macs Using ChronoSync" Guide. If you don't have your connection profile setup, then review the Setup Steps in the above guide to learn how to create the Connection Profile. Now that you have the ChronoAgent connection set, click the 'Choose' button in the Right Target pane and navigate through the folders on the remote Mac to locate the 'Pictures' folder you want to sync to on that remote Mac. In most cases, you will want deleted files from one target to also be deleted from the opposite target. To do this, turn ON the "Synchronize deletions" checkbox. When this option is turned ON, ChronoSync will delete files in the opposite target whenever it detects a deletion, keeping the two targets identical. Please note that no files will be deleted during the first synchronization because ChronoSync does not yet have a past history of any deleted files. Enable "Archive replaced files" as a safeguard so all deleted items will be moved to an '_Archived Items' folder. This is useful in case a mistake is made and you want to retrieve a file that was replaced or deleted. Manage the size and growth of the '_Archived Items' folder by visiting the 'Archive Handling' section in the Options panel. Visit the Options panel and customize any settings to tailor the sync for your specific needs. Refer to ChronoSync Help for details on the options listed within this panel. Under "Special File/Folder Handling", switch to "Custom" and match the settings below. Checking "Dissect Packages" tells ChronoSync to only copy files inside the Package file that have changed and not the entire Package file. This will greatly speed up your sync time. Leaving it unchecked will treat the entire photo library as a single file and ANY change within the library, no matter how small, will cause the entire library to synchronize. This is normally what you want but since these libraries are typically very large, treating them as a single file will result in significantly longer sync times. The dissect packages setting is an acceptable compromise for most users in this situation. Sometimes there are certain types of files you do NOT want synchronized. An example would be if you did not want to sync some personal documents to the other computer. To do this, select the particular folder or file in the Analyze view, right-click (or CONTROL-click) the selection, and choose "Exclude". You can also choose "Exclude" from the Actions menu. An exclusion is denoted by an "X" in the status column and means that the file will not be considered during the synchronization process. When you exclude a file it will be ignored during the sync and when you select a folder, all of its contents will be ignored. If you are following the "Sync The Home Folder Between Macs Using ChronoSync" Guide, then repeat the above Steps 1 through 8 to create a separate synchronizer document for each of the Music and Pictures folders you wish to keep in sync between the two Macs, then return to Step 4 in the above-linked home folder sync document. If you are using this Guide stand-alone to setup a synchronizer document to keep either of these two folders in sync between two Macs, then continue here with Step 9. Once you have all the above-mentioned settings in place, perform the synchronization. This can be done by choosing the "Synchronize" icon in the toolbar of the Synchronizer document. NOTE: It is recommended that you run a Trial Sync the very first time you perform the synchronization. That way, you can peruse the Trial Sync results to make sure you haven't made a simple configuration mistake such as selecting an incorrect target. If it looks like a lot more files than you expect will synchronize, or a sync in a direction you didn't expect, you should take a step back and double-check your configuration. Make sure to always synchronize each time you switch working to the other computer. Always run every sync from the source Mac using the same Container document. If a conflict should arise, choose the file from the computer you last used. Since you need to synchronize every time you switch Macs, it is not practical to schedule your task. Instead, you should manually run the sync every time you switch Macs to ensure the two Macs always stay in sync. Doing this will take some getting used to, but it's a habit that should be practiced. Make sure to always synchronize each time you switch over to the other computer. If you fail to do this, conflicts may arise. A conflict is when the same file has changed on both computers. Since you have to choose between one file or the other, you would lose the changes made to one of the files. If a conflict does arise, then choose the file from the computer you last used. Enabling "Archive replaced files" is a good safety net in case you choose the wrong file when resolving a conflict. Run Sync from Left Mac (The ChronoSync Mac). Choose "Left Files" for any conflicts. Choose "Right Files" for any conflicts.